A few days ago I posted a swan painted by Sladjana Vasic when she illustrated GOOSE LAKE: A YEAR IN THE LIFE OF A LAKE. Here’s her swan again but this time with the back story and poem from the book. The swans on our table inspired the poem. One year Goose Lake was home to a pair of swans. Their days were spent in splendid togetherness, one never far from the other. Even on cloudy days their white feathers stood out like two Viking ships sailing the lake one behind the other or side by side. The second year one of the swans became ill. Its mate remained close until the end. The sight of the dead swan on the lake made each day a day of mourning. The remaining swan left the lake and turtles profited until life eventually resumed without a trace of what once was. Two years later the swan returned. Perhaps it was flying from lake to lake searching for its lost mate. It seemed irritable and chased the geese onto the banks. After a few days it was gone. Now and then the swan returns briefly. We rejoice to see it suddenly swoop down over the trees, great wings beating, neck extended as though it can’t wait to arrive. Each morning I look to see if the swan is still with us. I hold out hope that this time it is home for good. I still grieve to see such a magnificent creature swimming alone. If birds experience sorrow or a sense of loss, I’m sure this one does. fire in the slanted early light. Here’s my poem inspired by the word “gone.” This poem is original and written for today’s post. The art is reprinted from my one and only e-book, GOOSE LAKE, beautifully illustrated by Sladjana Vasic. Thanks again, Sladjana! to rush down onto the water. noted by many, startled the day. aware of their presence without curiosity. to spend the dark hours as they would. allowing time for all to find their places. My love for living on a lake remains one of the highlights of each day. When I get up, I walk through the house toward the kitchen for coffee without turning on a switch. That way I see the water in the natural dusky light of predawn. This is the time of year when the geese seem restless. Many of them disappear during the day only to return to Goose Lake in the evening, issuing loud cries as they circle and glide in for a watery landing. I know the time is coming when squadrons of geese will take off, one after another, leaving the lake to the ducks. Many of those same birds will return to spend the winter here but something deep within tells them it’s time to migrate so they must go through the motions of leaving. Many of you know of my e-book of poems and prose about this quiet, lovely little lake. I have dubbed both the lake and the book GOOSE LAKE. The book is available on Barnes & Noble and Amazon for $1.99. GOOSE LAKE was illustrated by Sladjana Vasic and formatted by her husband, Milos.The foreword was written by Sylvia Vardell and Janet Wong. I haven’t posted a sample for quite a while so here’s the first one in the collection. when it’s too dark to see black fur. out to trick or treat. from wrestling in the street. 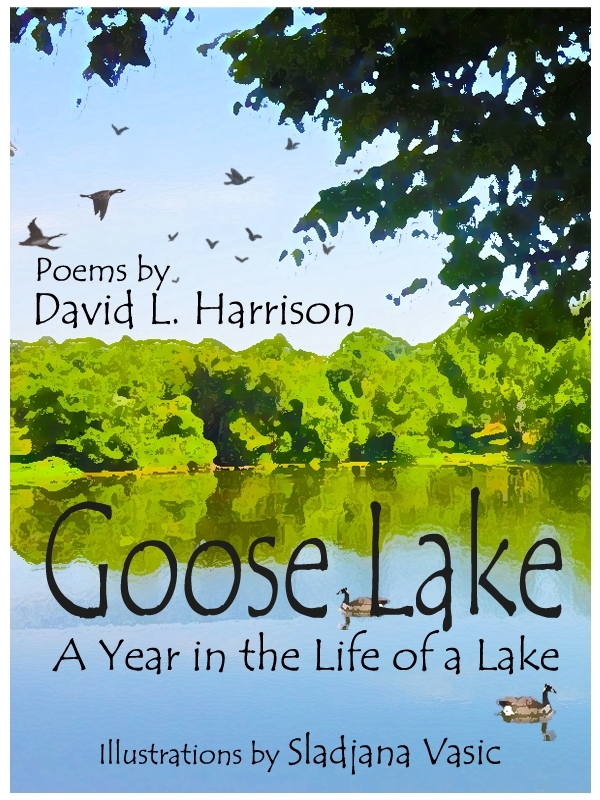 As of a few minutes ago, GOOSE LAKE, my newly released eBook of nature poems, is in 3rd place among today’s top sellers in children’s poetry and ranks #36 among books of poetry for adults. For those of you who have purchased a copy, thank you! Veda Boyd Jones has posted a lovely review on Amazon.com. Veda, many thanks for giving the new collection such a great send-off! If you wish to order a copy of GOOSE LAKE, you can download it for $3.99 onto your smart phone, iPad, Nook, or Kindle. If you want to send it as a gift, click on the “Gift” button and follow instructions. BULLETIN: GOOSE LAKE IS NOW AVAILABLE ON AMAZON.COM and on BARNESANDNOBLE.COM. Living on a lake has its privileges. I watch the sun come up across the water each morning and look out dozens of times each day to see what’s going on. I’m never disappointed. My endless fascination with life around the lake will be apparent when you read GOOSE LAKE, my first poetry collection published as an eBook. Sladjana Vasic illustrated the poems beautifully and Milos Vasic did the formatting. My courage to try this comes from the pioneering collections of poetry assembled and edited by Janet Wong and Sylvia Vardell. Janet mentored me through the steps and she and Sylvia wrote the foreword for the book. My thanks to all! The book begins . . .
As I stooped in my driveway for the morning paper, a delegation of geese hissing like punctured tires flat-footed it toward me across the grass. This was not a social call. My new house squatting on their land beside their lake was an outrage. Indignant to their pinfeathers the geese closed ranks and delivered their ultimatum in a furious chorus. Over time we humans near the lake have made peace with the geese which, on a busy day, outnumber us twenty to one. Our key concession is to their occasional messy forays into our yards. These Canadians don’t know about their ancestors, those hardy enforcers of goose law that established goose rights in the neighborhood. It’s always hardest for the pioneers. The lake lacks an official name but I call it Goose Lake. It seems fair. I hope you’ll download a copy of GOOSE LAKE. It’s priced at $3.99 and is available from Barnes & Noble (http://www.barnesandnoble.com ), Amazon (http://www.amazon.com ), and iTunes (http://www.itunes.com ). Formatting is suitable for Nook, Kindle, iPad, and smart phones. P.S. I’ve set up an additional e-mail address specifically for correspondence regarding GOOSE LAKE. It’s davidlharrison2-gooselake@yahoo.com . For anything else, please continue contacting me at davidlharrison1@att.net.